If you’ve been a reader for a while, you’ve probably noticed that we’ve been into keeping things simple, minimal and neutral around our homes. And we’re keeping with that trend with our Christmas decorating! 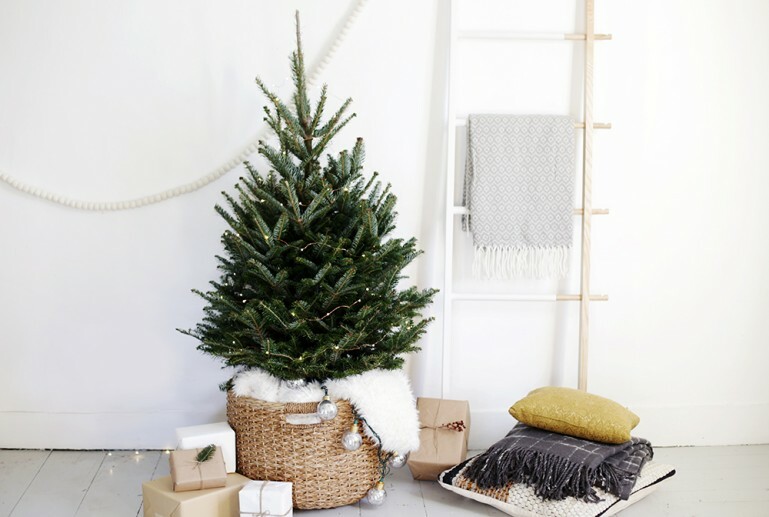 We’re partnering with West Elm to share how to style and set up this Scandi-Chic Christmas tree. 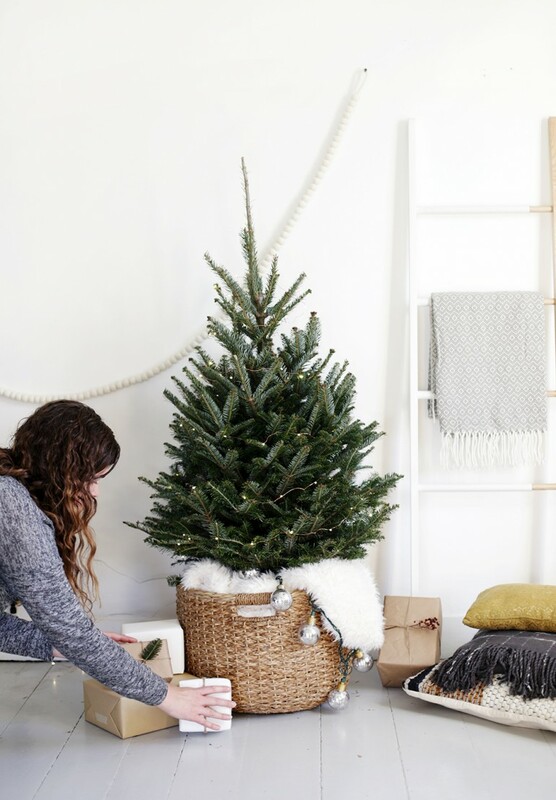 It’s perfect for small spaces – Caitlin picked out this cute mini tree for her apartment and with a few cozy items from West Elm, it’s perfect for bringing holiday cheer this Christmas season! Head on over to West Elm’s blog, Front + Main, for all the details! Where can you find a large basket like yours? Hi Kat – our basket is from Target! I am really digging this 🙂 I love having a big tree in my living room, but something like this would be perfect for my dining, bedroom or office 🙂 very nicely done! I love your little tree in the basket. 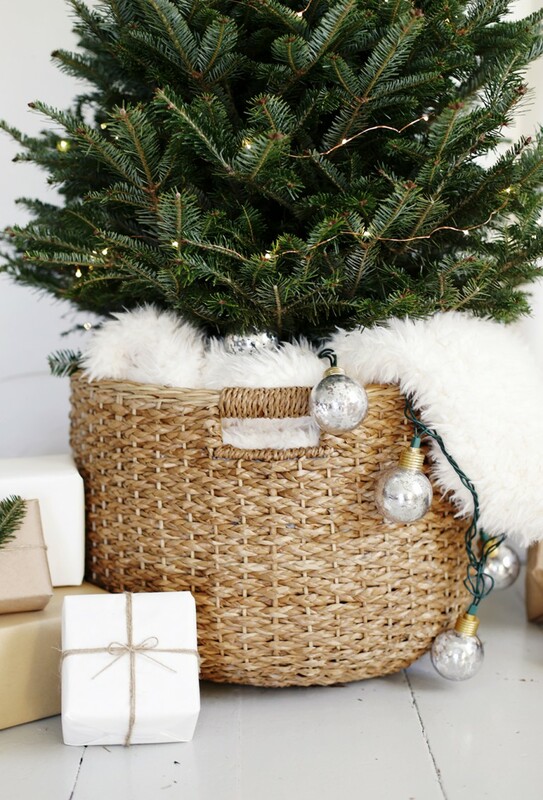 It inspired me to get my small artificial tree from the attic, and place it in a similar basket. Quick question, is this a fresh tree or a faux, and where did you get him, he’s so plump and cute?! Looks so lovely . What size wooden beads did you use here ? Hi Sarah – if you’re talking about the hanging garland, it’s actually a felt ball garland! It’s from West Elm! Hi Manda- how did you steady your tree in the basket? How did you keep it watered? 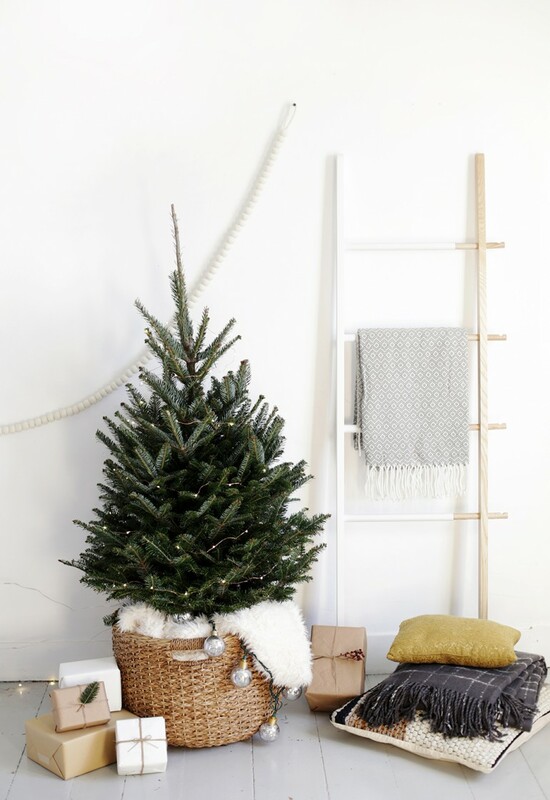 Hi Tara – the tree came with a stand, and we set the stand on an upside down bucket inside the basket. The stand around the tree held water, so that’s how we kept it watered, we just had to pull the blanket aside and then add water. You can see pictures of the inside of the basket and stand here – hope that helps! 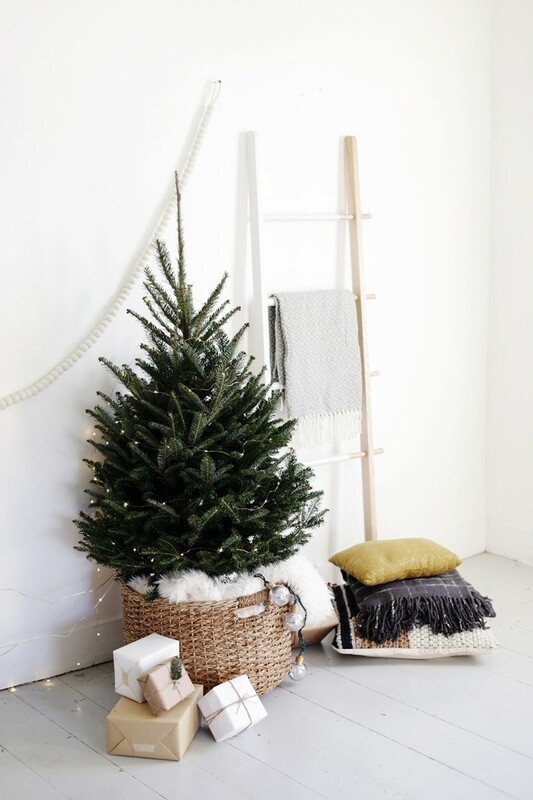 Probably a dumb question but how did you get the tree to stand in the basket? It’s so beautiful! 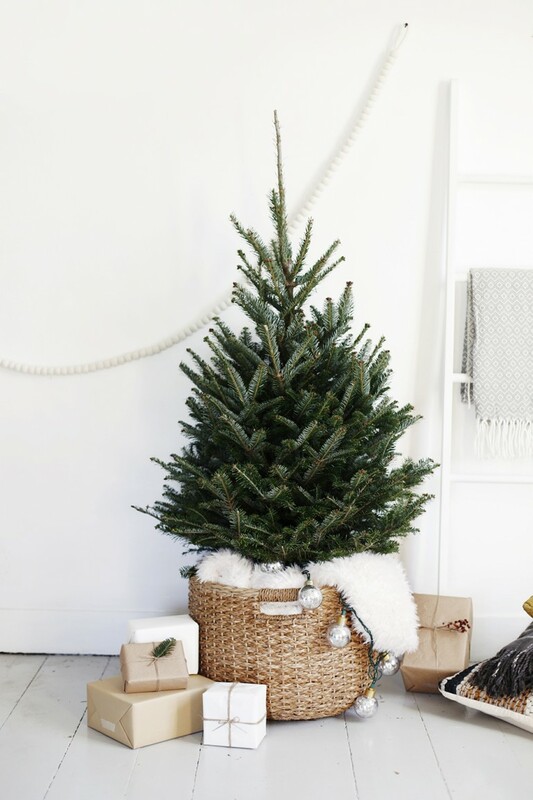 Hi there – the tree came with a stand, and we set the stand on an upside down bucket (to make it tall enough) inside the basket. You can see some pictures of that process at here. Hope that helps! Hi! Just wondering if you remember how tall your tree was roughly? It was about 50″ from the base to the very top! Thank you! It’s Behr Pacific Fog!